Mike Hartman - vocals on "... wie Wüstenregen", "Die Kyberniten", "Haravienna"
Julian Küster - acoustic guitar on "Haravienna"
Hacki Kommel - undistorted guitar on "Haravienna"
Jenny K. - vocals on "Vergessen und Verloren" and "Der gefallene Stern"
Markus Roth - synth solo, piano & organ on "Haravienna", flute on "Rückkehr"
Jef de Corte - orchestral arrangement on "Am Fluß von Sein und Zeit", wind instruments on "Verloren im Dunkel" and "Friedhof der Träume"
With their 2013 release, FLAMING BESS continues to scale the upward trajectory established by "Waechter des Lichts", while not quite fanning their feathers as on their original recordings. This is as rock oriented as anything they have ever done, with recent electronica yielding to a percussive bite. Mike Hartman is the main vocalist with Jenny K appearing on several tracks. As is customary, narration of the ongoing fable punctuates the proceedings, perhaps somewhat less obtrusively than has been the case in recent years. The album fairly explodes with a few rousing old style instrumentals that are not that dissimilar, although the theme of the first will reappear several times throughout the 77 minutes like a trusted friend. The ensemble approach illuminates the guitars and keys to best effect. It's true that the acoustic dimension remains perhaps forever buried, but some might not miss it. "Verzweifelt und Vergessen" is one of their best song oriented pieces, launching atmospherically before propelling forward rhythmically while retaining a spacey core. From here the quality descends a notch for most of the duration, although most pieces are still entertaining, the best being the epic "Haravienna" which overlaps azz/funk/psych territories shamelessly. It's hard not to admire the ambition even if the GPS loses its signal here and there. Whether or not FLAMING BESS is a rising star or even a star at all may be debatable, but this collective luminescence is anything but fallen. 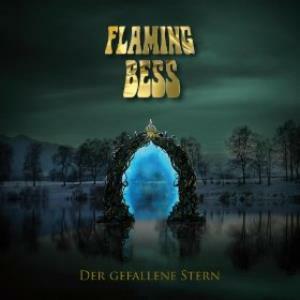 Post a review of FLAMING BESS "Der Gefallene Stern"